TACOMA CONVERTED GARAGE Welcome to the holiday season! Here are a few of our go-to, simple decorating and entertaining ideas. Holiday decorating can be overwhelming, and don't even get me started on entertaining. Quite honestly, we've mostly opted out for the past two years. But now that I'm not pregnant or nursing a newborn, I'm feeling much more excited to embrace the holidays. We'll be decorating, listening to Christmas music (okay, that already started), and entertaining guests this holiday season. And for us that will mean lots of simple decor, delicious food (and drinks too), and all the merriment we can make. 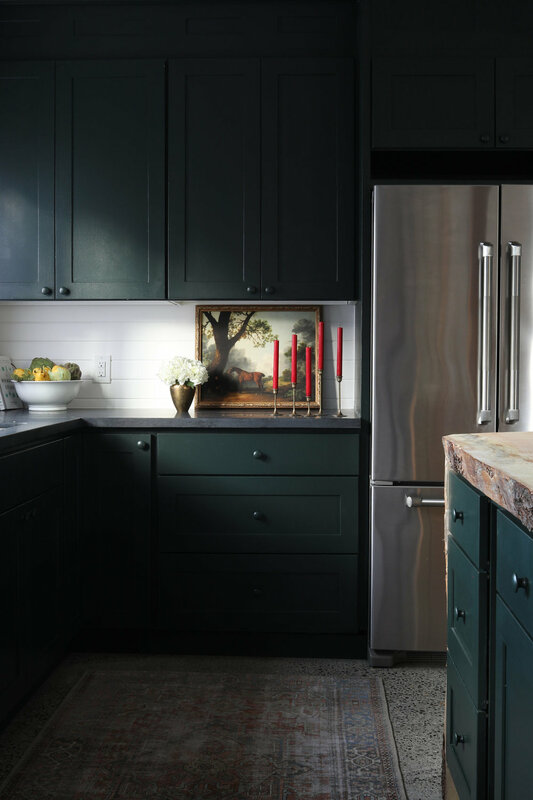 Scroll down for some holiday inspiration from the Tacoma kitchen. psst: I've included a shoppable roundup of holiday decor similar to what you see here at the bottom of this post. Fresh greens are always my favorite way to decorate at the holidays. The look great, they smell great, and there's no plastic involved. We usually buy wreaths and garlands from Costco, but since they weren't out yet when we decorated at Tacoma, I bought eucalyptus from the grocery store and attached it to a grape wreath with floral wire. It's an easy DIY and I'm hoping it will last through the season. If you're looking for something even easier (or last minute) for your range hood or mantle, try foraging a sculptural brach like Julie Blanner did or cut off a bit of garland like we did last year at the Porch House. There is something so lovely about vintage brass candlesticks, don't you think? They add a lovely patina and look Christmas-perfect with red, white, or beeswax taper candles. psst: there's a few of my favorite brass candlesticks from Etsy linked at the bottom of this post. Art is a great way to add a little festivity without the kitsch. This George Stubbs print (a free download from the MET) feels festive with all of it's greenery and the brass frame and there's no Santa or Rudolph in sight. I downloaded this owl print from the Audubon since it feels perfectly wintery and holiday-ey too. When it comes to entertaining for the holidays, we're all about a simple, fresh, and delicious menu. 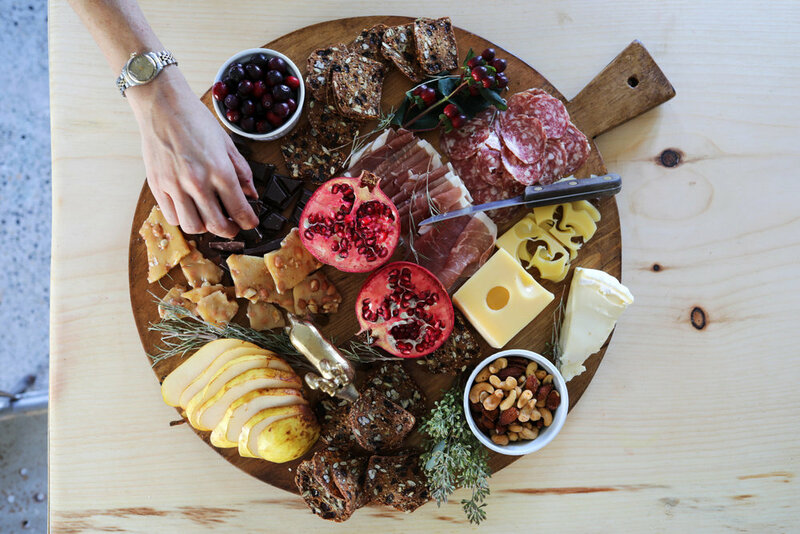 Often that means an easy charcuterie plate, which we'll shop for early and prep just before the party. We like to pile on a variety of meats and cheeses, crackers, bread, nuts, dried fruit, fresh fruit, olives, and classic treats like peanut brittle and chocolate. This one took 15 minutes to compile and I can vouch for it's deliciousness. We also stocked up on pears in the fruit bowl for a holiday nod. For drinks, we usually stick to beer and wine. Just pop the cork and you're in business. This little celebration included Pfriem's limited-edition aged beers (YUM!). We like to make the hot chocolate for the kids and add a little extra cheer with flavored marshmallows, candy canes, or better yet, homemade chocolate-dipped marshmallows. As promised, here are a few shoppable vintage decorations (and some new too) for your holiday home. We wish you the loveliest holiday season...and all the hot chocolate you (I mean your kids ;) ) can drink!